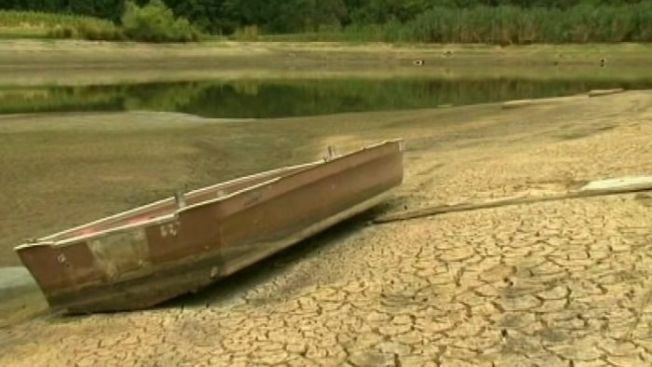 The worst U.S. drought in decades has deepened again after more than a month of encouraging reports of slowly improving conditions, a drought-tracking consortium said Wednesday, as scientists struggled for an explanation other than a simple lack of rain. While more than half of the continental U.S. has been in a drought since summer, rain storms had appeared to be easing the situation week by week since late September. But that promising run ended with Wednesday's weekly U.S. Drought Monitor report, which showed increases in the portion of the country in drought and the severity of it. In Texas, 91 percent of the state is abnormally dry while nearly three-quarters of the state are at a moderate stage of drought, according to the U.S. Drought Monitor. While those numbers are up from a week ago, it's a far cry better than a year ago when 100 percent of the state was not only abnormally dry but also at a moderate level. At that time, 97 percent of the state was in a severe drought, 89 percent in an extreme drought and 65 percent in an exceptional drought -- the highest ranking. As of Nov. 20, 49 percent of the state is in a severe drought, 23 percent in an extreme drought and 8 percent in an exceptional drought. See a map of drought conditions here. The report showed that 60.1 percent of the lower 48 states were in some form of drought as of Tuesday, up from 58.8 percent the previous week. The amount of land in extreme or exceptional drought -- the two worst classifications -- increased from 18.3 percent to 19.04 percent. The Drought Monitor's map tells the story, with dark red blotches covering the center of the nation and portions of Texas and the Southeast as an indication of where conditions are the most intense. Those areas are surrounded by others in lesser stages of drought, with only the Northwest, Florida and a narrow band from New England south to Mississippi escaping. A federal meteorologist cautioned that Wednesday's numbers shouldn't be alarming, saying that while drought usually subsides heading into winter, the Drought Monitor report merely reflects a week without rain in a large chunk of the country. "The places that are getting precipitation, like the Pacific Northwest, are not in drought, while areas that need the rainfall to end the drought aren't getting it," added Richard Heim, a meteorologist with the National Oceanic and Atmospheric Administration's National Climatic Data Center. "I would expect the drought area to expand again" by next week since little rain is forecast in the Midwest in coming days. "What's driving the weather? It's kind of a car with no one at the steering wheel," Heim said. "None of the atmospheric indicators are really strong. A lot of them are tickling around the edges and fighting about who wants to be kind of the hill, but none of them are dominant." The biggest area of exceptional drought, the most severe of the five categories listed by the Drought Monitor, centers over the Great Plains. Virtually all of Nebraska is in a deep drought, with more than three-fourths in the worst stage. But Nebraska, along with the Dakotas to the north, could still see things get worse "in the near future," the USDA's Eric Luebehusen wrote in Wednesday's update. The drought also has been intensifying in Kansas, the top U.S. producer of winter wheat. It also is entirely covered by drought, and the area in the worst stage rose nearly 4 percentage points to 34.5 percent as of Tuesday. Much of that increase was in southern Kansas, where rainfall has been 25 percent of normal over the past half year. After a summer in which farmers watched helpless as their corn dried up in the heat and their soybeans became stunted, many are now worrying about their winter wheat. It has come up at a rate on par with non-drought years, but the quality of the drop doesn't look good, according to the USDA. Nearly one-quarter of the winter wheat that germinated is in poor or very poor condition, an increase of 2 percentage points from the previous week and 9 percentage points worse than the same time in 2011. Forty-two percent of the plantings are described as in fair shape, the same as last week. Farmers who might normally irrigate in such circumstances worry about low water levels in the rivers and reservoirs they use, and many are hoping for snow to ease the situation. But it would take a lot. About 20 inches of snow equals just an inch of actual water, and many areas have rain deficits of a foot or more. NBC 5's Frank Heinz contributed to this report.